Vogue Paris Original pattern for Misses' one-piece dress designed by Jacques Griffe, copyright 1956. Fitted dress with flared skirt has diamond insets at sides. Zipper closing at center-back below neckline. Simulated front buttoned closing. Welt pockets. 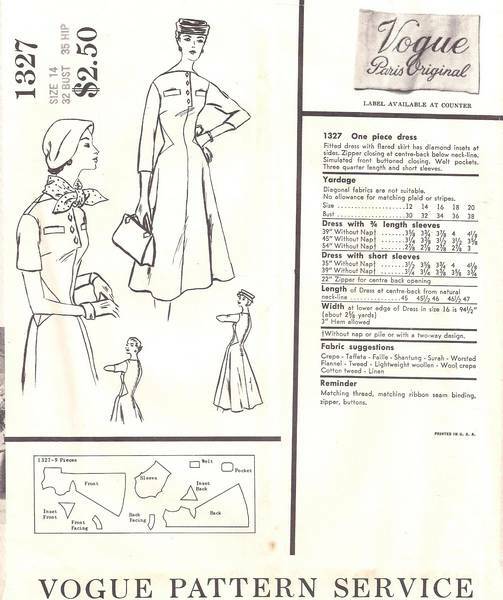 Three quarter length sleeves. Pattern is complete. The pieces have been carefully used. The linen finish pink envelope and all contents are in very good, well preserved condition.